Private Chef at home experience - La Belle Assiette — Sian Victoria. Have you ever wanted to host a top-notch dinner party, but the thought of your guests snubbing your cooking skills, the stress of planning a menu, food shopping and getting everything cooked on time and to perfection is too much to handle? Not to mention the pile of washing up and at the end of the evening. Well, La Belle Assiette got in touch with me a few weeks ago and offered me and four guests a private chef experience, at my home with a professional photographer. At first, I thought it would be so strange having a chef come to the house and cook and clean for us. But obviously, it would be rude of me to turn down some 'posh-grub' so of course, I said yes. All in the name of research, of course, I'm always happy to try out something new for the blog. La Belle Assiette is a private chef hiring company, they operate in France, Belguim, Switzerland, Luxembourg and the UK. You simply choose your location, date and time and a private chef will arrive at your home with a box full of fresh ingredients and get ready to cook, serve and clean for you and your guests. They are also available for events etc. I personally think its such a great concept, as it allows you and your guests to sit back and relax without the interruptions of having to keep rushing back to the kitchen to check on things. Our chef for the evening was Jacques Van Der Merwe who arrived along with his bread maker and quickly got to work in the kitchen, all while sharing fascinating stories of his time in South Africa, where his Bistro earned his restaurant a place in the top 4 restaurants in South Africa last year. The evening started with an amuse bouche of caramelised onion buttermilk bread served with hand churned butter, salt flakes and truffle oil. We all couldn't wait to get stuck into the bread, it looked and smelt divine. The bread was cooked to perfection and the caramelised onions were gorgeous, especially with the melted butter and sprinkles of salt flakes. We had to tear ourselves away from eating it all as we didn't want to spoil our appetites for the four courses that were to follow. So Jacques kindly wrapped it up for us to indulge in later. I had it for breakfast the following morning, which was certainly something to wake up for. For the starters, Jacques prepared crab roulade, avocado, cucumber sauce, horseradish mayonnaise & basil. For the vegetarian option, he substituted the crab for tofu tossed in a southern spice mix. Since only going vegetarian in the new year I've only had tofu once and wasn't that struck on its silky texture, however how Jacques cooked it was fantastic and I would have never of guessed it was tofu. The whole dish was presented beautifully, full of colour and unique flavours. Surprisingly, I really loved the cucumber sauce so much so that I was trying to scrape every little bit from the plate. For the meat eaters, Jacques made pork belly, brandy honey, apple gel & geranium salad, bacon praline, pomme anna served with a cider gravy. My two guests who tucked into this splendid dish were going 'ummm umm' with every mouth full, they thoroughly enjoyed it. They said how amazing the bacon praline was, with the crunchy texture and the delicious cider gravy. They were raving so much about the gravy, that the chef shared his secret tip to making it, he also put aside a pot of gravy for them to take home which was lovely of him. For the vegetarian main, the chef created a colourful spring dish of red peppers & polenta batons, curried cauliflower, living lettuce, charred corn & onions, goats cheese mousse & smoked red pepper gel. Firstly, this dish was incredible and full of flavour. I loved every mouthful and would have easily eaten so much more, I couldn't possible highlight which part of the dish was my favourite as it contained all my favourite veggies so was truly scrumptious. 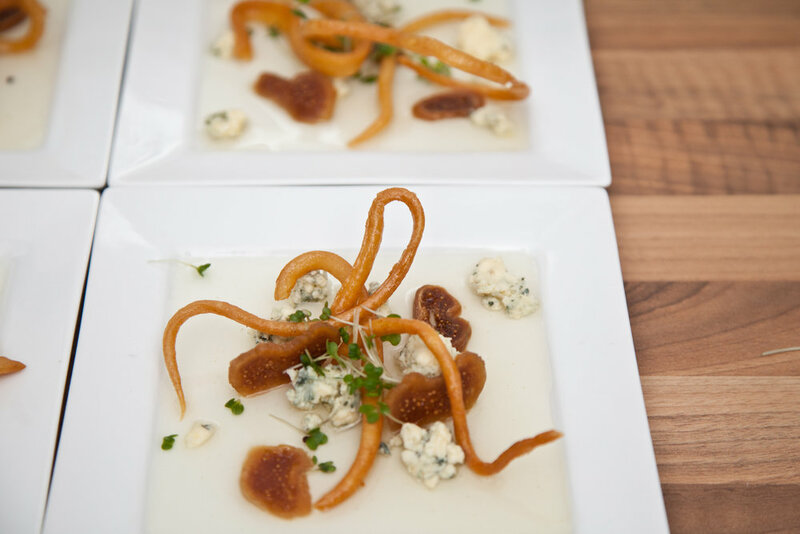 The cheese course consisted of Stilton, lavender infused honey, sticky figs & koeksister twigs. I'm not really a fan of fancy cheeses. I only eat it when it's smothered all over my pizza! So I wasn't quite sure if I would like the cheese course as I've never tried Stilton before. But this dish has certainly converted me. The honey and figs complimented the cheese beautifully and we were all raving about those unusual looking koeksister twigs. The dish was unique and presented so well. For dessert, Jacques created a masterpiece, and we all found it so fascinating watching him create it with his pink and glitter spray. The dessert consisted of a frozen creme brulee, salted caramel, white chocolate mousse and dehydrated raspberry powder. It looked like a piece of art, when we broke through the white chocolate ball we found a creamy chocolate mousse and when we got to the bottom we were delighted to find a mouth-watering layer of salted caramel. It was out of this world! Jacques is amazingly talented, he not only created incredibly unique dishes but he created a fantastic dining experience for us, we loved every mouth full and can't possibly recommend him highly enough, the food and experience were faultless. To be honest, when I got offered this experience, I slightly hesitated at the thought of having a chef and a photographer in my kitchen. But I am so glad I took up the opportunity, as it was not awkward at all. Jacques was lovely, friendly and so outgoing. I and all three guests thoroughly enjoyed the entire experience. Fancy hosting your own dinner party? - you could hire a private chef in Birmingham. Got time to check out my other food & drink posts? Disclaimer: Complimentary experience for review purposes. All words are my own. © SIAN VICTORIA 2010-2019. ALL RIGHTS RESERVED.